Student satellite from the University of Bologna, testing a cold gas microthruster system and the platform for a future Earth observing satellite. Technology satellite for University of Bologna, Italy. Launched 2012. Status: Operational 2012. First Launch: 2012-02-13. Last Launch: 2012-02-13. Number: 1 . Gross mass: 12 kg (26 lb). Apogee: 1,415 km (879 mi). Family: Technology. Country: Italy. Launch Vehicles: Vega. Launch Sites: Kourou ELV. Almasat - . Mass: 12 kg (26 lb). Nation: Italy. Class: Technology. Type: Technology satellite. 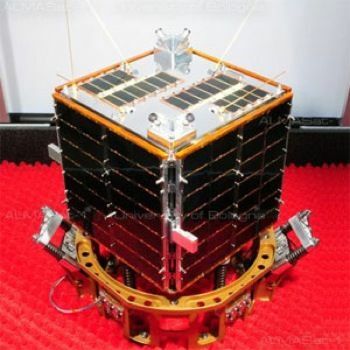 Spacecraft: Almasat. USAF Sat Cat: 38078 . COSPAR: 2012-006B. Apogee: 1,415 km (879 mi). Perigee: 312 km (193 mi). Inclination: 69.50 deg. Period: 102.20 min. Student satellite from the University of Bologna, testing a cold gas microthruster system and the platform for a future Earth observing satellite..